There are many ways to help your home or business stand out, but why should you limit them after you pull down the shades? A new window covering trend for 2014 that saves space, catches attention, and can be customized for retail store fronts, residential homes, commercial buildings, restaurants, and galleries has a large potential for your storefront or home. Screen printed roller shades come in a variety of colors and materials, read design ideas below about this new product and then contact 3 Blind Mice to choose the right option for your storefront or home. The Qmotion shade can be screen printed with that perfect wedding photo, motivational office quote, or just simple promotional use with your company logo and phone number. Let your creativity run wild and print seasonal specials that can be used in your storefront every year. Retailers can choose from a variety of custom shades for seasons, holidays, birthdays, and more to make a statement whether the shades are up or down. Selecting a motorized option or using a timer can also help you attract more attention to your storefront. If renovating your business, you can use a screen printed roller shade to show off the new building layout or a unique “coming soon” sign. View this video to learn more about the Qmotion shade and other new roller shade options. In your home you could use these shades to decorate a child’s bedroom with their favorite movie characters, or spice up your “man cave” with roller shades customized with any sports team logo, graphic, or image. Fun idea: Surprise your grandmother with a picture of the family printed right on the inside of her screen printed roller shade! 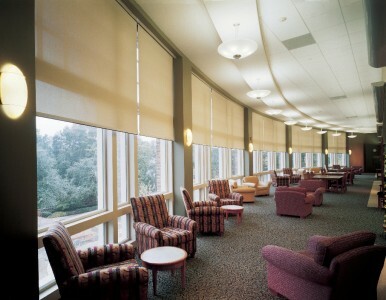 Screen printed roller shades can be motorized or set up with a manual cord option. For the safety of your pets and animals, the shades can come cord free. Thank you for contacting 3 Blind Mice Window Coverings. We do not provide Screen Printed Roller Shades that can be cut to size. We sell custom window coverings only. I like your suggestion to use a roller shade if we’re renovating our business to show off the new building layout. The company I work for is planning to undergo renovations soon, so we’ve been talking about ways to maintain business during the process. I hadn’t considered that a roller shade could help highlight an aspect of the renovation, so thanks for sharing that tip!